Week 3 in a nutshell …. 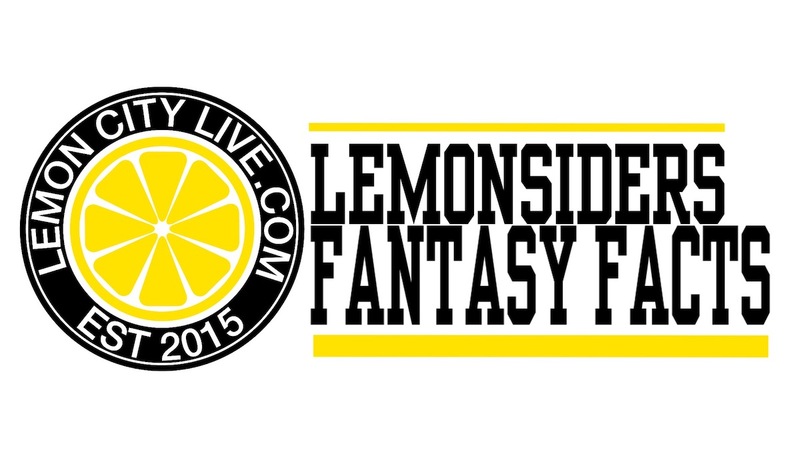 Guys, I first and foremost whole heartedly apologize to the loyal Lemonsiders Fantasy Facts readers. Not only did the NFL weekend fail you but I totally failed you too. I deserve every single curse word and angry GIF you may have used this weekend if you followed my advice. Not that it helps you at all but I myself had a horrible fantasy football weekend in my leagues. We can all cry together. Oh yeah, and THAT THE DAMN NEW YORK JETS WOULD WIN A GAME!!! Ever since about 1:30 PM on Sunday, I’ve been trying not to throw up at the FULL tilt I was experiencing. Aside from a DeSean Jackson touchdown, my takes on start/sit was a complete dumpster fire! Even my buy/sells turned out to be wrong. Somehow, gotta shrug this off and move on to week 4 and PRAY it treats us all better. Let’s get into them Lemonsiders Fantasy Facts. After only having 34 attempts in the first two weeks, Gore comes out in Week 3 and has 25 attempts and scored a TD. Frank Gore is the Energizer battery that keeps on going and going. Every year fantasy owners try and count him out because of his age but Gore keeps on producing. It’s obvious the Colts trust Gore with the bulk of the carries and if they do, you should too. 9th player in @NFL history to record 3,000 career rushes? Despite not having a 100 yard game yet this season, Alshon is still Wentz’s top target and shouldn’t be let go of just yet. Wentz is off to a hot start and the big games for Alshon are around the corner. Sit tight and don’t panic. After looking like a prime candidate for the toss out list in the first two weeks, Marshall bounced back with an 8 reception, 66 yard performance against the Eagles. The next two weeks the G-men face favorable passing defenses before heading into a rough slate. I’d hold for a few more games to see if this game was a sign of good things to come or if it was just a fluke. After 3 weeks, AP has 23 attempts for 77 yards and 0 TD’s. Mark Ingram and Alvin Kamara seem to be the running backs to own for New Orleans. Not feeling too good about AP in this offense. The rookie WR out of East Carolina was a player I was interested in during the draft but seems like he’s better suited for Dynasty Leagues. Bills offense has been heavy on the run and Zay has only seen 10 targets in 3 games. He’s an interesting rookie for the future but as far as this year, doesn’t need to be on your rosters with this slow start. Last week I mentioned Funchess as a sleeper for this week and he didn’t exactly fully excel but he did show promise. Had 4 catches for 58 yards but did receive 10 targets. If Kelvin Benjamin injury keeps him sidelined, Funchess and McCaffrey will be the target leaders moving forward. Next week they face the Patriots who are giving up an average 341 passing yards and 2 TD’s. On a team with no clear cut number one receiver, the passing back from Miami has filled the void as a receiver for the Browns. Coming off a game with 6 receptions and Isaiah Crowell only rushing the ball 12 times, Duke is a player I want on my rosters. A safe receiver and also serves as the handcuff to Crowell in case of injury. If you’re in a league where you have a deep bench, this is someone I’d look to stash. After missing Week 1 due to Hurricane Irma, the Dolphins have to play 14 straight weeks. Jay Ajayi’s knees are worrisome and I’d like to have his backup on my bench just in case. If you got off to a 3-0 start in fantasy, this is a solid pickup on a deep bench. I wrote about Beast Mode being drafted too high and 3 Weeks in, seems about right. He’s not the worse lead RB out there but not sure how high of a ceiling you’re expecting from him. The next 4 weeks Raiders face a brutal slate. He’s a “safe” RB but provides no upside an will only give you 10-15 points per week. Unless your other RB’s have high ceilings, I would try to sell Marshawn. You have to hope that he stays healthy ROS too. Not a gamble I want to take.